Openbravo provides professional commercial open source ERP solutions, packaged for companies of different sizes. 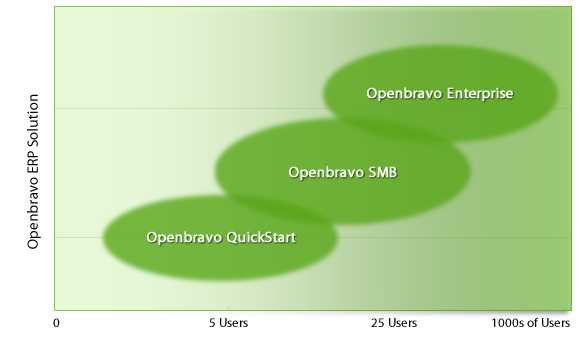 These solutions are available exclusively from official Openbravo Business Partners. Openbravo's innovative, scalable ERP Platform underpins all of these solutions, providing a seamless, incremental transition for growing companies or large enterprises rolling out standardized custom solutions regionally. For small businesses looking for fast ROI on a minimal upfront investment, with the opportunity to seamlessly grow into either a complete SMB or Enterprise solution. Includes a pre-configured set of native Openbravo functionality, which can be implemented with 40 - 80 hours of implementation and training services. vailable as a single-server solution, with the possibility to easily upgrade to a multi-server solution. For companies planning fewer than 5 concurrent ERP users* to start. For small and midsize businesses seeking the benefits of a complete Openbravo ERP implementation. Available as a single-server solution, with the possibility to easily upgrade to a multi-server solution. For companies planning fewer than 25 concurrent ERP users* to start. For large businesses and enterprises seeking the benefits of a complete Openbravo ERP implementation. Available as a multi-server solution. For companies planning more than 25 concurrent ERP users*.